Blpmovies.com is the PUP that uses misleading techniques to prevent removal. Use Reimage to locate malicious components and get rid of them faster than with uninstall instructions. A full system scan blocks virus reappearance and prevents traffic to malicious domains. Blpmovies.com virus is available as the tool which attempts to present itself as a reliable and highly useful search tool, which is compatible with Internet Explorer, Chrome, or Mozilla Firefox. 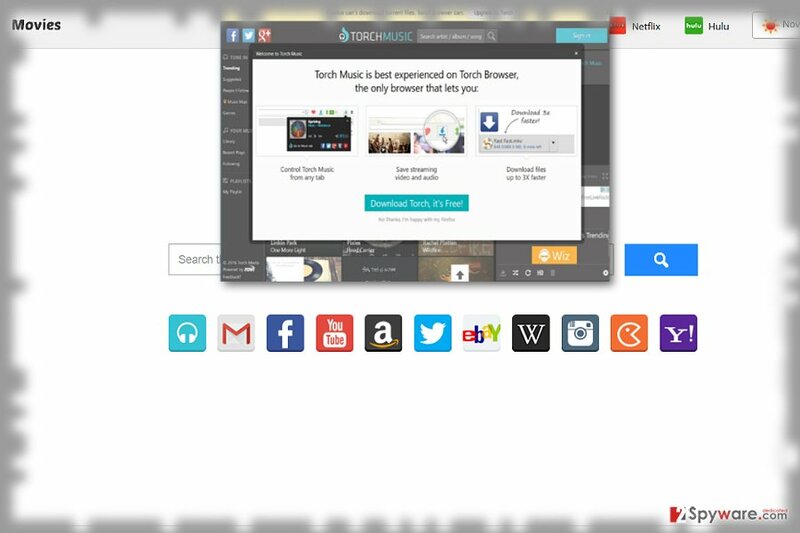 Despite the provided quick-access links to Amazon, email accounts, and popular entertainment sites, the tool is classified as a browser hijacker rather than an ordinary browsing site. It is praiseworthy that the tool designed by Aztek Media, located in Cyprus, does not specifically trade your information with business partners, but it may do so when it comes to non-personal information. 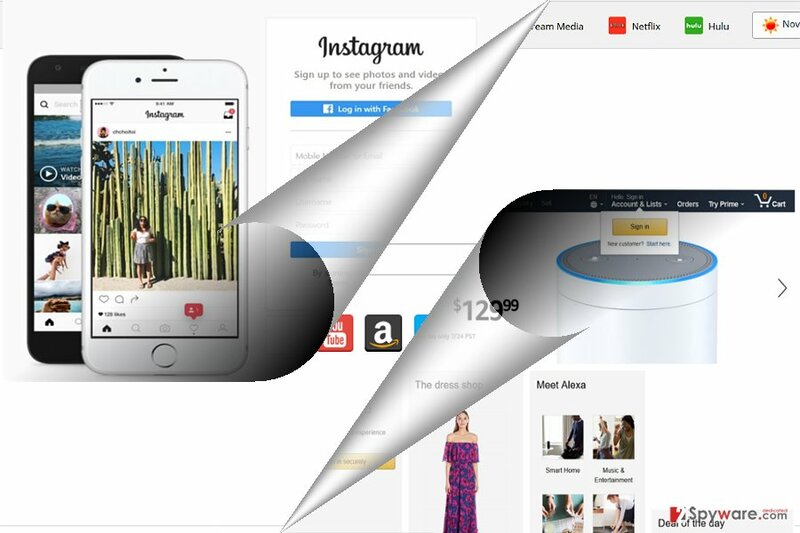 As a result, your browsing sessions may be interrupted by continuous pop-up ads. Furthermore, though the website offers you a wide range of features, some of them fail to work. Therefore, you may consider performing Blpmovies.com removal. While some developers of search engines do not bother with equipping their search tools with additional features, others try to appeal to users with multiple seemingly useful specifications. Though a couple of them may indeed come in handy at times, especially, the weather forecast which changes according to your geographical location, additional services mean additional contracts with other search engines. Additionally, due to cooperation with third parties, you may notice occasional BLPSearch redirect tendency. Usually, they happen to be poorly protected shopping or gaming sites. Consequently, they may contain a malicious ad or link. If you are looking how to uninstall it, you can remove Blpmovies.com and its associated toolbars and browser extensions if you employ an anti-spyware application, e.g. Reimage or Plumbytes Anti-MalwareMalwarebytes Malwarebytes. Due to the sufficient number of additional services included in the search tool, you may notice this browser infection promoted in other shopping or gaming websites. If you were looking for a new tool, you have been redirected to this web page. Alternatively, the search tool might be promoted as an add-on to free applications. Pay attention while installing free software. Choose “Advanced” settings to pinpoint unnecessary applications on time. Blpmovies.com offers you a wide choice of services. Nonetheless, it is still categorized as a PUP. Though this search tool is hardly malicious and it may contain more pros than other hijackers, but you may soon want to remove BLPMovies.com virus. Though the hijacker does not have its own “Install” button, you may need to delete all its associated tools and add-ons. You may check manual BLPMovies removal guidelines. They will instruct you how to perform full browser reset and eliminate its web scripts. Dutch users might notice the promotional offers, thus, they should be especially vigilant. Here, look for Blpmovies.com or any other recently installed suspicious programs. Wait until you see Applications folder and look for Blpmovies.com or any other suspicious programs on it. Now right click on every of such entries and select Move to Trash. You may check these steps which will help you root out all BLPMovies.com elements. When in the new window, check Delete personal settings and select Reset again to complete Blpmovies.com removal. Once these steps are finished, Blpmovies.com should be removed from your Microsoft Edge browser. Here, select Blpmovies.com and other questionable plugins. Click Remove to delete these entries. Now you will see Reset Firefox to its default state message with Reset Firefox button. Click this button for several times and complete Blpmovies.com removal. Here, select Blpmovies.com and other malicious plugins and select trash icon to delete these entries. Click Reset to confirm this action and complete Blpmovies.com removal. Here, select Extensions and look for Blpmovies.com or other suspicious entries. Click on the Uninstall button to get rid each of them. Here, look at the Homepage field. If it was altered by Blpmovies.com, remove unwanted link and enter the one that you want to use for your searches. Remember to include the "http://" before typing in the address of the page. Now you will see a detailed dialog window filled with reset options. All of those options are usually checked, but you can specify which of them you want to reset. Click the Reset button to complete Blpmovies.com removal process. ^ Tony Haile. Facebook may finally have to compromise its user experience in order to keep growing. Recode. News and commentary. ^ Adam Pothitos . Malvertising concerns grow as everyday users are in high risk. Mobile industry Review. News and opinion for industry executives and mobile fanatics. ^ Terminate virtual infections. Zondervirus. IT News, Reviews and Malware Removal Suggestions for the Dutch community. This entry was posted on 2017-07-24 at 03:46 and is filed under Stealing programs, Viruses. You can quickly scan the QR code with your mobile device and have Blpmovies.com virus manual removal instructions right in your pocket. How did you remove Blpmovies.com virus?